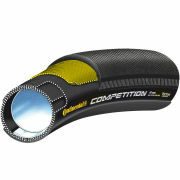 The Continental Competition tubular Tyre, used by Pro Teams and privateers all over the world. 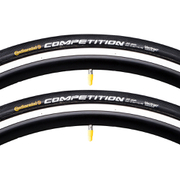 A resistant carcass with two puncture piles, a synthetic rubber tube and 14m of Nylon thread to keep inflated and rolling fast - 700 X 22mm. Black and Anthracite.